Poised to deliver spectacular results in the most challenging of situations, the Nikon D7200 is a versatile DX format DSLR that caters to both professional as well as newbie users. Featuring a 24.2MP CMOS sensor and an EXPEED 4 image processor, the D7200 can record 6fps footage at full resolution. It has a large buffer capacity for continuous high speed shooting. This processor and sensor combination also avails a top native sensitivity of ISO 25,600, which can further be expanded to ISO 51, 200 and 102,400 sensitivities for the black and white format. The camera also lets you record Full HD videos with up to 60fps, and also lets you capture memories in the form of beautiful time lapse movies. Rounding out its feature set, the D7200 is also characterized by an apt 51 point AF system, with 15 cross type points, for quick and accurate focusing in a variety of conditions. In addition to the sheer imaging benefits, the D7200 also incorporates a large 3.2inch wide angle TFT LCD monitor, SD card slots, and features built in WiFi connectivity with NFC for simple linking of your smart device. Proficient at performing in both still and video realms, the D7200 is an all around shooter that blends sophisticated imaging technologies with refined handling and design for an ideal combination of versatility and convenience. 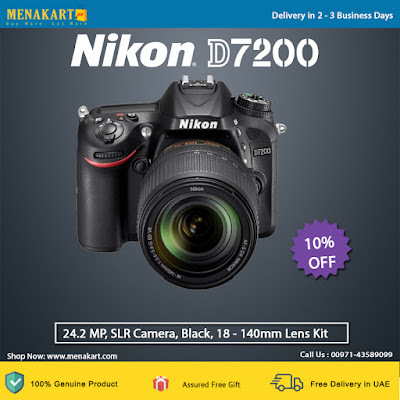 This Nikon D7200 is available in a black color. The D7200 produces remarkably pure, sharp photos, and videos. Its 24.2 MP DX format CMOS image sensor works together with EXPEED 4 image processing and NIKKOR lenses to enhance detail and tonality. It also enables recording of high resolution still imagery and Full HD videos with the utmost clarity, low noise, and smooth color gradations. This outstanding image quality is maintained all the way up to ISO 25,600 for astonishing low light images. You can also expand the ISO range from 51,200 to 102,400 to shoot monochromatic photos in even more challenging lighting situations. Whether shooting stills or video, selecting the 1.3x crop mode extends the reach of DX sensor, getting you closer to sports, action, wildlife and more. The Nikon D7200 gives you a chance to share all your outstanding pictures with no hassle, even when on the go, using the built in WiFi and NFC feature. Just touch your compatible smartphone or tablet to this camera via NFC, to establish a connection. Once connected, you can use your smartphone to browse pictures on the D7200 and the share them by emails or post them online! With its 6fps continuous shooting capacity, the D7200 is an outstanding choice for sports, wildlife, and other fast action scenes. It has a large buffer size that can handle up to approx. 100 shots of continuous shooting when in JPEG/fine/large format. Shoot in nearly any light from dusk till dawn, and capture everything from sports and action to wildlife and everyday moments. The Nikon D7200 camera is designed with a 3.2inch 229k dot TFT LCD that supports a wide viewing angle with three levels of brightness monitor adjustments and an ambient brightness sensor. You can view pictures as soon as they've been clicked with the utmost ease.